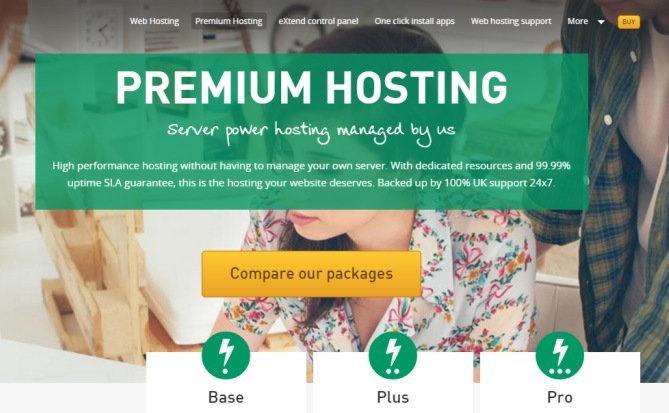 What is Premium Hosting and how is it different? We recently launched a brand new Premium Hosting service that gives you comparable power and reliability to a VPS/Hybrid server without any of the management. With full 24 x7 UK support and our system administrators and engineers managing all updates and maintenance for you, it’s completely hands-free hosting! Here’s a more in-depth look at exactly what you get and what makes it different to help you decide whether or not Premium Hosting is for you. How is Premium Hosting different? This is the most frequently asked question since we launched the product, and the short answer is: it depends where you’re coming from. In a nutshell, here are the main differences for each type of hosting (for more details, or for information and advice specific to your own website/s and set up, please get in touch with our sales team or raise a support ticket). Dedicated RAM (4GB, 8GB or 16GB). You get two, load balanced virtual machines that act as webservers; the machines are private and the underlying code means other customers can’t affect the performance of your hosting. One-click installs, including resource intensive one-clicks historically only available to VPS/Hybrid/Dedicated Server customers such as Magento, with more to follow soon. Host servers use state of the art Dell hardware with 256GB of RAM. Much faster storage servers, combining 15k SAS disks with enterprise grade SSD for caching. Very low contention and sharing of resources. Coming soon: individual site and server performance monitoring tools. You get two virtual machines that act as webservers; the machines are private and the underlying code means other customers can’t affect the performance of your hosting. One-click installs previously only available for VPS/Hybrid/Dedicated Servers, e.g. Magento, with more to follow soon. Host servers use state of the art Dell hardware with 256GB RAM. Coming soon: automated migration of sites from your Reseller Hosting to Premium Hosting. Useful for if your customers demand more resources, but can’t or don’t want to manage a server. Two load balanced virtual machines that act as webservers; the machines are private and the underlying code means other customers can’t affect the performance of your hosting. Your site is not subject to a single point of failure. Option for more, dedicated RAM (8GB or 16GB). No need for any server management or upgrades. Full 24×7 support (not just limited to hardware & network support). Full 24 x 7 support (not just limited to hardware & network support). No need for any server management. Unlimited disk space (Plus and Pro Premium Hosting plans). Upgrades are handled automatically and only require a reboot. Is Premium Hosting for me? It all comes down to what you really want from your web hosting, and what you need it for. If you’re happy to pay more for more powerful, fully supported hosting, then Premium Hosting is worth considering. If you want powerful hosting with full control, root access, and the ability to install and run anything you like, then a VPS, Hybrid Server or Dedicated Server is likely to be your best option. If you want a good balance between price and performance for averagely busy websites, then standard shared hosting (Web Hosting or Reseller Hosting) is fine for your needs. As before, if you’re unsure what’s best for you, have a chat with our sales team who can go into specifics for your particular needs. They are available via email, phone or live chat. Heart Internet – You do it again, premium products ROCK! From a reseller perspective – will it be one Premium Package to one external customer? i.e. I would not want to mix seperate customers on the same package? If so – will we ever be able to sell like reseller using a premium style setup? Even if it is a pay by stepped resource usage? Reseller is great for simple shared, but not anything more than the most basic CMS. Therefore, a gap for premium reseller is what i am looking for. Thanks Jenni, A positive from you guys which will hopefully keep me and those bigger accounts here! I look forward to more info.